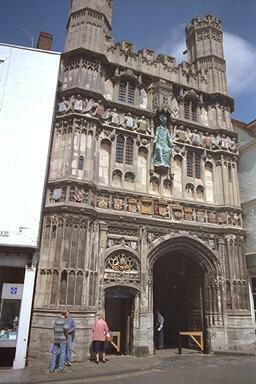 The Cathedral gate into the Cathedral is quite a sight. The bronze figure of Christ in the centre is a recent addition, a bronze figure installed in 1991 replacing a figure of Christ destroyed in 1642 by Parliamentarians who used the figure for target practice. These days, this is where you pay to enter the Cathedral precincts. If you get a chance look at the great wooded doors, which are beautifully carved.